Ashburton Grove - Arsenal news and Arsenal opinion: Mertesacker, Arteta and Benayoun impress on debuts -Wenger after Barca youngster? Mertesacker, Arteta and Benayoun impress on debuts -Wenger after Barca youngster? A win is a win and putting three points on the league table was the objective. We achieved our aims and I don't think any Gooner can be unhappy with that. It would be fair to say that yesterday's performance wasn't the type of champagne football we've come to expect under Arsene Wenger. But in fairness we've not seen a lot of that football at all in 2011. What we all wanted were three points and we secured them with a freakish Andrey Arshavin goal we're not likely to see a repeat of any time soon. The manager as expected handed debuts to Per Mertesacker and Mikel Arteta. I was pleased to see these two were named in the team and excited with the prospect of what they can offer our team. And on the whole I thought they had good games. They both offer us something we've lacked in recent season... experience. And that impact was seen straight away as Arteta was involved in an early move which saw Aaron Ramsey fire over the bar. Then minutes later the Spaniard took charge of a free kick on the edge of the area but his effort couldn't beat the wall (Good to see the Arsenal coaching staff have drilled that into him already!). After about seven minutes, the save of the match was made after Danny Graham got ahead of Mertesacker to fire a header in which Wojciech Szczesny got down to and caught. An early let off for both the German and Arsenal. Theo Walcott could have put his team ahead on 15 minutes when he was set clear by Arteta. However the Swansea goalkeeper Michael Vorm got a block on the ball and Walcott's goal bound effort was cleared by Ashley Williams. The Arsenal had more efforts in front of goal. Aaron Ramsey and Emmanuel Frimpong with efforts from outside the box and skipper Robin van Persie's floated effort too deep and went over the bar. Swansea at the other end were fortunate not to have a goal when a dangerous cross touched Kieran Gibbs' heal and luckily found its way past the far post. The goal game in the 40th minute and it was bizarre and freakish to say the least. Vorm tried to roll the ball out to one of his player only to find the back of his heel. The ball fell kindly for Arshavin who placed his shot inside the goal from a tight angle. I don't think many of the Arsenal players on the pitch yesterday could have scored that goal - van Persie maybe - but for all the stick he gets Arshavin is a world class player and one we should appreciate that. He'd been having a good game and looked like he was up for it. Half time we led and there were plenty of positives to take from the first 45. And as the half wore on we became more and more nervous. I suppose that wasn't helped by the lack of effort on goal from the Gunners. Robin van Persie could have added to our lead had his shot been inches inside the post. His effort in the 57th minute hitting the woodwork and going behind for a goal kick. It was however the Welsh team who were growing in confidence. They had nothing to lose and were showing more attacking threat. Arshavin came off to be replaced by Yossi Benayoun for his Arsenal debut and the Israeli offered a new dynamic going forward. Another change saw Emmanuel Frimpong - who was good but needs to work on his passing and shooting - come off for Francis Coquelin. We lacked much cutting edge and only in the final ten minutes when Marouane Chamakh entered the fray for van Persie did we have our two on target efforts of the half. The Moroccan had a header from a Gibbs cross which was saved on the line and then the left back himself shot at goal in the dying minutes but his shot was saved. At the final whistle there were no boos. We knew this team needed time to adapt, especially after two days of training together. But there are promising signs. I thought Mertesacker had a decent game. There were questions about his pace but in one first half incident he didn't dive in to make a challenge but just stood his ground and made a crunching tackle which showed he could read the game well. There was also another superb block from the German when he threw his body at the ball when a Swansea player fired a shot in on goal. Arteta showed early promise but slightly faded as the game went on, much like the rest of our team. But I think the early signs from the first half especially are that he is exactly the type of player we need. His experience will be invaluable and he slotted straight into our system. Both Sagna and Gibbs had tidy games, as did Koscielny. Szczesny had a good game also. He really is a confident guy! His turn in the box when under pressure from Graham will make a few DVDs this Christmas and no doubt Soccer AM next Saturday. In midfield, we saw another good game from Emmanuel Frimpong however his passing let him down on occasion in the first half. Aaron Ramsey is a player I like a lot and I think he did well. He'll want to find the target more with his shooting but working with Arteta will develop his game. Theo Walcott has got a bit of an attitude at the moment and I'm not sure that's a good thing. All too often for my liking he's not involved enough in the game. And then when a decision goes against him he'll be in the referee or assistant referee's face. That's all very well - and I'm pleased he's fighting his corner - but I'd rather he just got on with his game. He could be devastating against the opposition for us but all too often he's sloppy in possession and his final ball is woeful. I think he thinks he's better than he is and unless he starts producing he'll be quickly replaced by Gervinho. Arshavin had a decent enough game but his tracking back leaves a lot to be desired (how long have I been saying this!). However he's the type of player who can turn a game and we have very few of these in the team. Up front van Persie had a in different game. He did have a very good chance in the second half which hit the post but he's yet to find his range with Arsenal this season. Hopefully that can start on Tuesday night. "It was vital for us to win the game. I think we started quite well but slowly the nerves took over. We played with the handbrake on and were restrictive in the second half. "It is not often that we pass the ball back to our goalkeeper when we are at halfway. You could see in the second half that we just wanted to get over the line and we didn't make a mistake." So three points is three points but now we must focus on our next game in Germany on Tuesday. 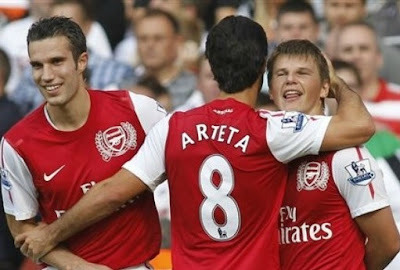 We'll forget about the performance but probably not the Arshavin goal. A quick round up of the stories making the Sunday newspapers. The People report Arsene Wenger is keeping tabs on Barcelona midfielder Thiago Alcantara and could try to sign him in January or next summer. They say Wenger has asked for first refusal on the player as part of the deal that saw Cesc Fabregas return to Spain. Henry Winter in the Sunday Telegraph looks at the debuts of Mikel Arteta and Per Mertesacker. And in The Observer, Paul Hayward believes a sense of fun needs to return to The Arsenal for us to get back to our best.